UPDATE (as of November. 3): The cut-off date to reserve a sleeping room within the IASS block at the Conrad Dubai Hotel has passed. You can check availability and prevailing rates at www.conraddubai.com. IASS 2016 will take place at the Conrad Dubai, located at P.O. Box 115143, Sheikh Zayed Road, Dubai. 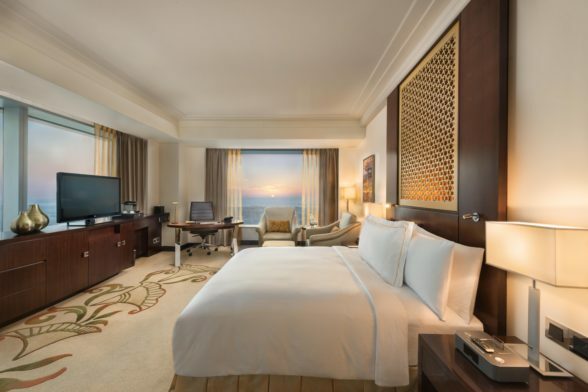 The discounted Flight Safety Foundation group room rate prior to the cut-off date was AED 950 single or AED 1050 double occupancy plus applicable taxes (10% municipality fee, 10% service fee, and a AED 20 tourism fee per night per room). The group rate is inclusive of of buffet breakfast and wireless internet. NOTICE ABOUT UNAUTHORIZED HOUSING PROVIDERS: Unauthorized third-party organizations named Expo Housing, Exhibitors Housing Management (EHM), or Exhibition Housing (EH) has been contacting past International Air Safety Summit (IASS) participants claiming to represent FSF with an offer to make hotel reservations for IASS 2016 in Dubai. Be advised that they are not affiliated with FSF and have NOT been contracted by FSF to handle housing or anything related to IASS 2016 or any other FSF business. Hotel reservations at the group rate for IASS should always be made directly from the web link provided above. FSF will never call or fax a hotel reservation request form to ask for your credit card number. If you have been contacted by any other housing organizations claiming to be affiliated with FSF or have any questions, contact the FSF events department immediately at events@flightsafety.org. Confirmed registrants of IASS 2016 are eligible to take advantage of a 10% discount on all published market direct return fares on an Emirates flight to/from Dubai. View details on how to book your ticket to IASS on Emirates.